I am trying to figure out what an inscription on a bronze cannon barrel says. I believe it to be Arabic but feel free to advise me if you think differently. The two lines start off the same way. I think that first word is "Allah". I don't have any idea what the inscription reads. However, the fellow at the muzzle appears to be more from the Indian subcontinent than the Middle East. The shape of the mustache and the gem on the forehead of both he and the "lion" lead me to that conclusion. Whatever it is ... it's a beautiful piece of work! Islam constitutes about 14% of the India population today and about 4 centuries ago the northern parts of India were ruled by Muslims, so it could easily be Islamic or Arabic script on a canon made in India. I'd suggest taking it to a knowledgeable museum or university. Doesn't look like Arabic to me, Z. Can you identify what country it came from? I'll admit to being somewhat ignorant of the history of the Indian subcontinent. In the link above are a few pictures that have similar decoration to Zulu's cannon, circa 18th century. 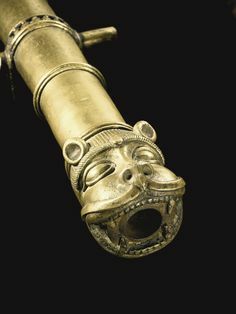 In several internet searches I've found any number of highly decorated Indian cannon ... but only a few with both animal style muzzles and breeches. All the pictures in that link were Photobucket blanks. The barrel I have is trying to be one of Tipu Sultan’s cannons, many of which were captured by the British East India Company’s troops in the siege of Seringapatam in 1799. Tipu Sultan was killed in the siege. His bronze artillery pieces were beautiful sculptures (castings really but you know what I mean.). All of the tubes I’ve seen were in the form of tigers, with muzzle, cascabel, and both trunnions in the form of tiger’s heads. While the owner of the barrel thinks it is authentic, after looking at it, I do not believe so. It's still a pretty cool barrel. Hmmm, I passed this by a lanuage specialist I know. I still need to find out what it says. I thought about joining a Muslim discussion forum I found and asking about it but after thinking about it, I decided not to. I finished the naval carriage for it today. As soon as I get some pictures, I'll post them.